Knock out wind and cold without giving up light, fast-breathing comfort. The North Face Apex Bionic Jacket’s Apex ClimateBlock fabric is 100% windproof and water-resistant. It's also light, stretchy, and soft so it offers full-blown breathability for aerobic missions. It is the perfect choice for athletes that like to play outside in all seasons and weather. "Is this the discontinued version of this model or the current one (described on the North Face site as having an updated fit for 2014)? Thanks." "This is the new 2014/2015 style!" " Does this have inside pockets"
"This jacket does not have interior pockets, though it does have a headphone pass through port from the chest pocket to the inside." I have only recently started buying Northface gear. I have a Tri-climate specifically for winter. So recently I purchased the Apex Bionic for the spring season coming up. I love the Apex material. It blocks all wind and does a good job against water. It is not waterproof but it will hold up to light rain. I have used it in weather from 10F to 40F so far and it works great and still kept me warm. It still look professional enough that I can wear it for work too. So overall it is an amazing jacket. I recommend this jacket to everyone. There is a size assistant for picking the correct size. It does not take height, or arm length, into consideration. This jacket is made for men under 5' 10"
This jacket fits me perfectly for a medium. The arm sleeves are slightly long but is compensated with velcro straps if the sleeves need to be pulled back. I'm 6'1", 210, the XL fits me OK in the body but the sleeve length is too short. I have several of these from seasons past, this one is cut different. Also I think the overall finish and quality isn't there like it used to be. I hate to compare but I looked at Kirkland brand shells at my local you-know-who store that seemed as well made for a fraction of the price. I can't buy any more NF jackets due to sleeve length issues. This North Face Apex Bionic Jacket fits great and looks amazing on my boyfriend. Peter Glenn had super fast shipping and the price was better than I found anywhere else (and I've been comparison shopping for months!!!) great purchase! This North Face Apex Bionic Jacket has become my new favorite jacket. It is very warm with the fleece lining, wind resistant and the color is great. Not one complaint. I'm very tall and thin at about 6'4''. The large is perfect arm length. It is a bit boxy but like I said I'm very thin. Fabric snags on anything and everything. I purchased this North Face jacket for my husband. It fits well, looks great, he says its very comfortable, not too heavy, but keeps him warm even in 20 - 30 degree weather. This was a Christmas present for my husband and he loves it. In the past hes been prone to just going without a coat or throwing one in the car in case he needs it because he hates to be hot or feel constricted but he wears this coat all the time so it must be comfortable. I have to also praise Peter Glenn for having a quality product at the most reasonable price I found. I'm always a little nervous ordering from a website I don't know but no need to fear, the transaction was smooth and the delivery was just as promised. Love this updated version from the bionic series! 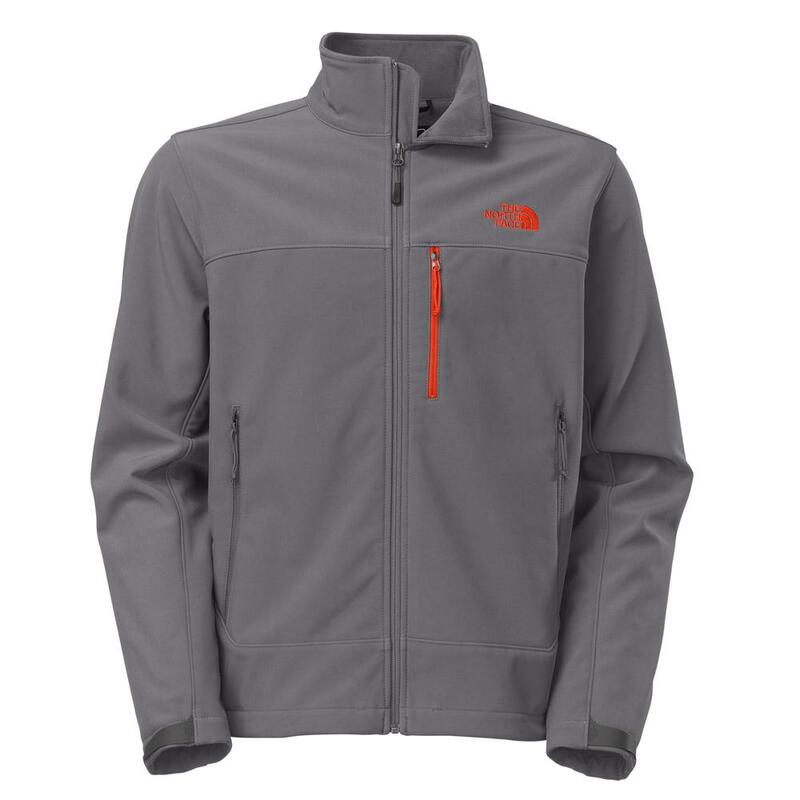 This The North Face Apex Bionic Jacket was a steal with the 20% coupon plus the natural savings at Peter Glenn. My son has the olive green color version of this jacket and I can't wait until I get to use it. Love Peter Glenn and their customer service! You can't beat their prices. One son saw a fellow worker with the jacket and both sons just had to have one. Received jackets in time for some cold weather and sons very happy with warmth and protection. Taller son does wish that the length was slightly longer. Buy it, you won't regret it. I searched everywhere for my Men's Apex Bionic Jacket . This jacket was so popular that it probably went out of stock quickly. Anyway, I found my jacket online and I got it at a reduced price. I saved about 50 dollars. I got mine in black with snorkle blue accents in the large size. The fit is excellent. It is lightweight and very comfortable to wear. I have always wanted to buy a North Face jacket and this is the first time I was able to afford one. I recommend this jacket 100%. I bought this jacket for my boyfriend. It fits perfectly and we've already been out 3 times and people have noticed ad stated that they loved the colors and how the jacket looked. It's just a jacket perfect for most occasions and it keeps you warm but is also lightweight. Love it! This jacket was absolutely perfect and exactly what I was looking for! The color is grade as is the fabric. I couldn't be more happy with it! True to size. Beautiful color. Nice quality. Very happy with this purchase. My friend has essentially the same jacket that fits me perfectly - its a Summit Series though. Unfortunately, large does not equal large across styles. The shoulders and arms fit nicely but the waist wrapped around me 1 1/2 times. Luckily NF was kind enough to pay the return shipping. I am extremely bummed that the jacket I want is not available anymore.